During a rowdy after-work drinking session, perched on a tiny plastic stool at a sidewalk “bar”, I discovered my boss had been sent to Afghanistan as a reporter. I was instantly impressed. I started asking questions but his replies were a little evasive. He was already drunk and I presumed his English was not good enough to tell the wild and woolly tale. Most journalists are inherent story-tellers, a trait that only becomes stronger with a willing audience and a few beers. I’d been working at the paper for a few months and this was the first time I’d been invited along to the legendary after-work drinks. At the table were some of the guys from the layout room, me and Mr Minh*. The guys seemed a bit nervous about having a girl along. I hadn’t been in Vietnam long enough to realise the hierarchical nature of society. What I saw as an after-work bonding session, where everyone was equal over a few beers and a bite to eat, was really an obligation that the younger guys had to fulfill after being asked by the boss to go drinking, or di nhau. In exchange, the boss paid. Not always a such a bad deal. Di nhau means drinking til you’re stonkered. It means eating special beer snacks, things like boiled quail eggs, steamed sea snails or tiny chili-coated crab claws. It means beer with ice. 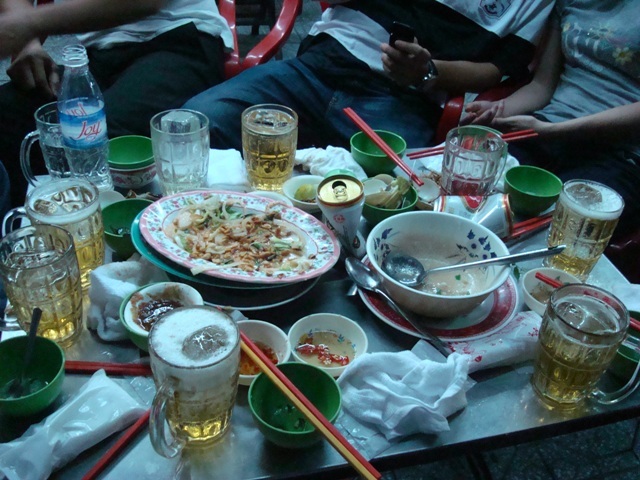 It means each sip of beer must be toasted — loudly — with the Vietnamese drinking toast of mot, hai, ba… YO! (One, two, three, DRINK!) And then smashing glasses together, often slopping beer over the snacks. It means proudly proclaiming how many cans of beer you can drink. Sometimes it means switching to rice wine or Johnnie Walker when you just can’t drink any more beer. Mr Minh, a former sports reporter, had been sent to Afghanistan to further his career. I got the impression he wasn’t there very long. A week or so. During this time he’d gone along to a Taliban press conference. “What was the press conference about?” I asked. Mr Minh waved his glass towards the centre of the table. “YO!” Everyone had a sip of beer. One of the layout guys started asking if I could use chopsticks to pick up peanuts. I showed him I could. “YO!” Everyone had another sip of beer. “YO!” Everyone had another sip of beer. “What do you mean, sit on the floor,” I asked. Mr Minh waved his beer glass at the footpath. “On the floor,” he said. “YO!” Everyone had a sip of beer. Behind us, in the darkened office building, delivery drivers were loading up their trucks and motorbikes with huge stacks of newspapers. Motorbikes were still driving past, even though it was after 1. The newspaper was supposed to be put to bed by 12 but somehow this deadline was never met. The “bar” had several other tables of dedicated drinkers. At the food cart to one side, the staff chatted and played with their mobile phones, ready to serve if summoned by the Vietnamese hail of em oi, which translates as “hey, you there”. “So, Mr Minh, this press conference. How did you know about it? Did the Taliban send out a fax?” Mr Minh made a kind of a tsk-face and raised his glass. “YO!” Man, this was tough going. One of the layout guys tried to distract me again by talking about food. Mr Minh started telling me about how he’d trained as an engineer in the military. I was really confused. I took a sip of beer, unthinkingly. “YO!” One of the layout guys tried to cover up my faux pas. I clinked glasses and had another sip. More confused now. How rude is it to drink before being YO-ed? In hindsight, that drinking session was probably pretty painful for Mr Minh and the layout guys. Subordinates shouldn’t question the boss. At after-work drinking sessions, the deal is you drink the boss’s beer, laugh at his jokes and maybe indulge in a bit of flattery. No wonder Mr Minh found me such hard work.